The 2017 list of IoT security companies contains extensive information on 150 independent IoT security vendors, including classification based on capabilities, revenue, and industry focus. PRESS RELEASE: Hamburg, Germany – July 26, 2017 // IoT Analytics, a leading provider of market insights and strategic business intelligence for Industry 4.0 and the Internet of Things (IoT), just released its inaugural Global IoT Security Companies List. The comprehensive database, which is the first of its kind on the market, includes 150 IoT Security companies worldwide. With billions of IoT devices now connected to the internet and many new threats emerging, cybersecurity is evolving quickly into the main concern for businesses and consumers alike. Most of the independent security vendors analyzed have a background in either traditional IT security or in OT security. While all are adapting their security solutions in the IoT context, at this stage no single vendor has an offering that covers all 21 analyzed technology elements of an end-to-end IoT security solution. The most comprehensive vendors cover 12 out of the 21 elements. Many only focus on one or two of the 21 elements (e.g., chip security, or update and patch management). The IoT Security database itemizes the 150 market participants in greater detail across 60 sets of information. Technology insight: The majority of IoT security companies tend to focus on specific areas of IoT security. Most of the companies focus on unified threat management (41%) and activity monitoring (30%). Many companies partner with other vendors to provide holistic end-to-end security for the overall IoT solution. 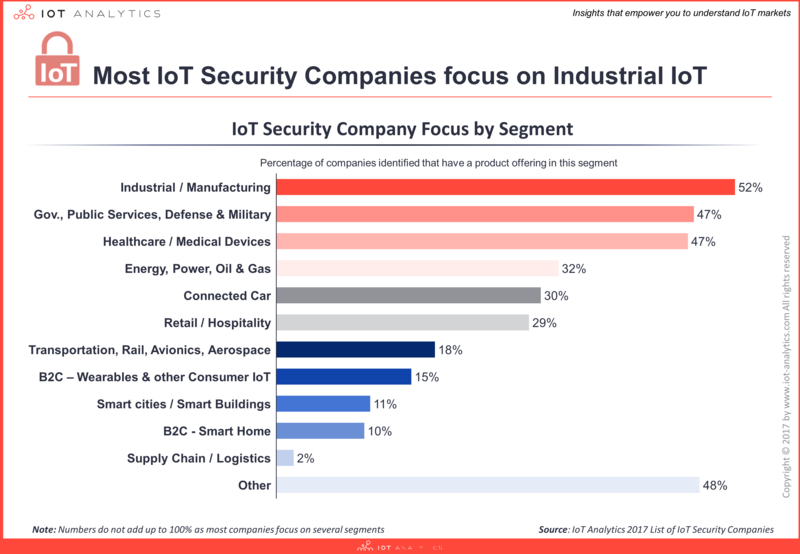 Segment insights: Of the 12 industries analyzed, most of the vendors focus on supporting IoT Security Solutions in Industrial/Manufacturing (52%), Government, Public Services, Military & Defense (47%) and Healthcare verticals (47%). Followed by Energy (52%), Connected car (30%) and Retail (29%). Compared to the number of enterprise IoT projects tracked, focus on healthcare security appears to be above average while Smart City Security seems to be underserved by the vendors. Regional insights: Even though IoT security companies from 17 countries worldwide are represented, more than two thirds of the firms in the list are headquartered in the US. 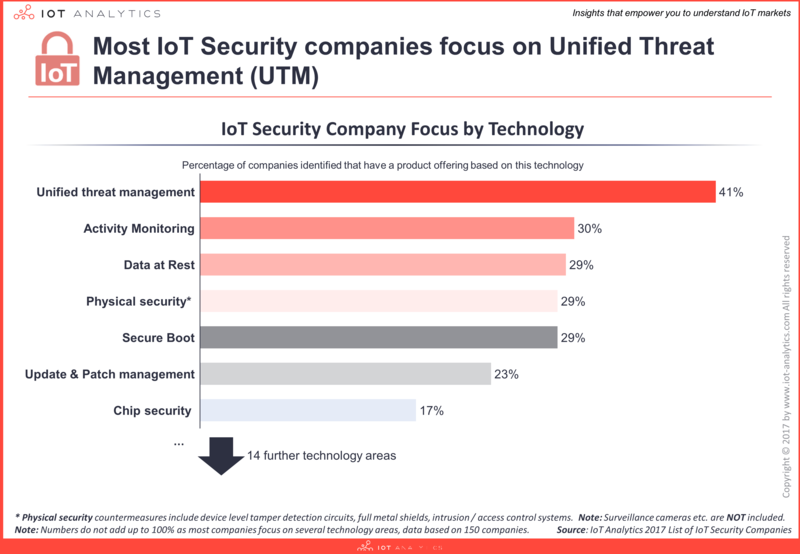 Market dynamics insights: More than one third of the IoT security companies listed have started operating within the last 5 years. Most funding has been invested in IoT security companies offering infrastructure and endpoint security. Total funding stands at $6.8B but a large part of that has gone into companies mainly focusing on IT security. Note: The list only considers those that offer independent IoT security products, not those that secure their own IoT platform or IoT solution in-house. The 2017 List of 150 IoT Platform Companies is available for PURCHASE HERE and a FREE SAMPLE is also available. For more on IoT security from our research stream, look out for our IoT Security Market Report 2017-2022 to be released in August 2017.